Witchcraft of the Stars has always been considered powerful and it dates back to the ancient Egypt and Mesopotamia. In fact, Star Magic is considered one of the oldest and most powerful forms of Magic. A Star Magician taps into the powers of the Stars in order to collect and direct the energy of the Stars. And Lyrid Meteor Shower is a favorite event for Star Magicians. One “branch” of Star Magic is Astrology, the art of foretelling the Future by knowing the ways of the Stars. An ancient Mage would never distinguish Witchcraft from Astrology as the system was born and evolved together as one. The Three Wise Men who predicted the coming of Jesus Christ were, in fact, Powerful Mages from Mesopotamia who studied the ways of the Stars. Becoming a Star Mage or a Star Witch one must begin to know the ways of the Stars. In Magical Recipes Online we’ll give you tons of Lessons on Astrology and in Star Magic too. Another thing about Stars Magic is that’s so fun! We love looking at the night sky. It connects us with the divine. 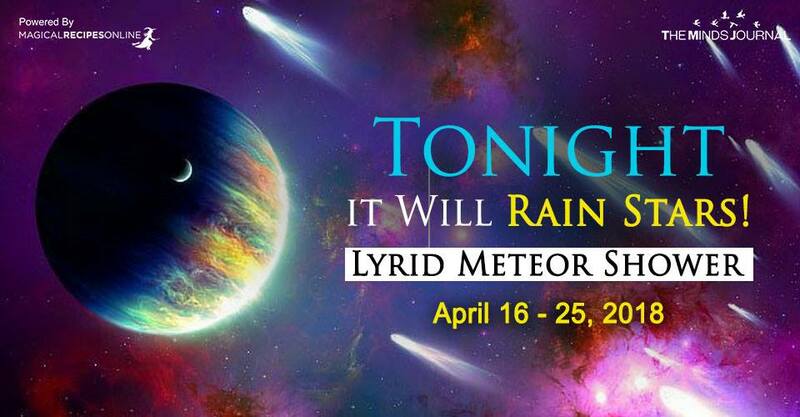 The April Lyrids are a meteor shower lasting from April 16 to April 26 each year. The radiant of the meteor shower is located in the constellation Lyra, near this constellation’s brightest star, Alpha Lyrae (proper name Vega). The shower usually peaks on around April 22 and the morning of April 23. We usually count a range from 5 to 20 meteors per hour, averaging around 10… amazing right? Although occasionally, a Lyrid meteor shower may boost up to 100 falling stars per hour! AMAZING! Thankfully, we only have to care about ‘light pollution’, as observers in rural areas will have the opportunity to see the sky full of falling stars because of the New Moon. Yep, the great lady of the sky will make a subtle appearance as today is the New Moon. Lyra is a magical instrument crafted by Hermes (Mercury) himself and gave it to his brother, God of Sun, Arts and Witchcraft Apollo. The Music Played by this instrument was so divine that all creatures would be mesmerized. TIP: Although occasionally, a Lyrid meteor shower may boost up to 100 falling stars per hour! AMAZING! The Stars coming from Lyra, are believed to possess magical purposes. Star Witches love the Lyrid Meteor Shower as it brings out all the magical powers associated with Apollo, God of Magical Arts. The Celestial spheres (or cosmic spheres, or celestial orbs) were the fundamental entities of the cosmological models developed by Plato, Aristotle, Ptolemy and later Copernicus and others. In these celestial models, the apparent motions of the planets and the other stars are accounted for “by treating them as embedded in rotating spheres made of an aetherial, transparent fifth element – aka quintessence – like bright gems set in orbs. Ptolemy stated that while this happens, stars sometimes slip out of this gap, flashing towards the earth. Shooting stars are hence an indication that the Gods are now paying attention to whatever you would ask for.